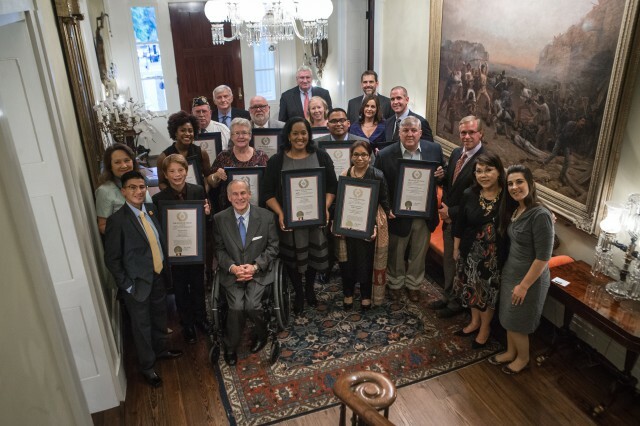 First Lady Cecilia Abbott, Honorary Chair of the 2017 Governor’s Volunteer Awards, and Governor Greg Abbott hosted a reception at the Governor’s Mansion last night honoring the eleven winners of the 2017 Governor’s Volunteer Awards. In their 34th year, the awards - presented in conjunction with the OneStar Foundation - honor individuals and organizations in Texas that have gone above and beyond to enrich the lives of those in their communities and throughout Texas through volunteerism and service. Erin Moody is currently completing her second term of service as an AmeriCorps member with Communities In Schools of Central Texas, a dropout prevention program. During her service term, Erin has carried a caseload of more than forty 6th through 8th grade students at Lockhart Junior High School with whom she meets individually for at least one hour per week. Last year, one hundred percent of Erin’s students improved in academics and behavior, ninety percent passed all four of their core classes, and one hundred percent were promoted to the next grade level – making Erin the only AmeriCorps member to have these results with such a large caseload of students. Erin has also facilitated numerous student-led projects on campus during her service. Erin has gone above and beyond to build relationships and initiate strategies that encourage and empower the youth at Lockhart Junior High so that they have the best opportunity to reach their full potential as well-educated, engaged young citizens. For over 30 years, Arlen and Mary ’Beth Lohse have been volunteering as drivers with Meals for the Elderly in San Angelo. In 2004, upon their retirement, the Lohses started volunteering full time through West Texas RSVP, a Senior Corps Program. They deliver meals on at least seven routes within a 5-day work week, though they often go beyond that by serving as substitute or emergency drivers. But they Lohses don’t just deliver meals – Mary ’Beth is known as the “napkin lady” for always providing a seasonally inspired napkin with the meals, and they also provide clients with special packages of cookies on milk delivery days, bologna on bread days, and lollipops – including sugar-free lollipops for diabetic clients. Many in the San Angelo community say there is no one who does more for the Meals for the Elderly program or the clients served than Arlen and Mary ’Beth Lohse.